LOMA LINDA, Calif. -- A dog who was stung hundreds of times by bees in a Loma Linda backyard has died. 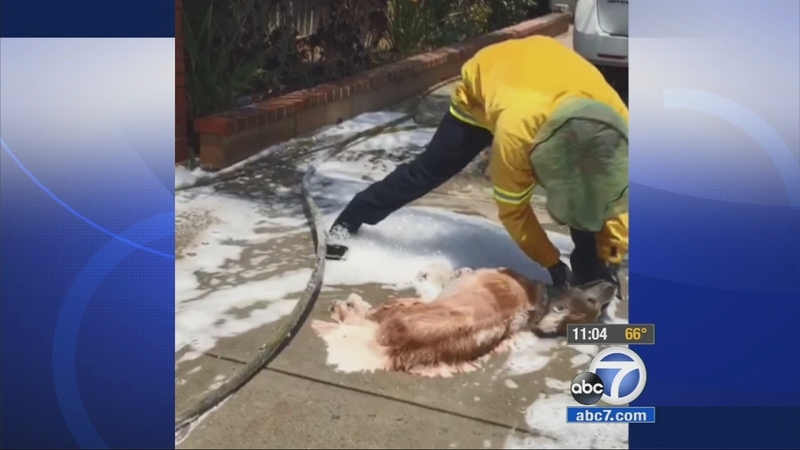 Authorities say a 43-year-old man was giving his dog a bath on Sunday in the 25500 block of Van Leuven Street when the bees attacked. The dog had been sprayed by a skunk the previous night, police said. The man was stung about 100 times and the 12-year-old golden retriever named Daisy suffered a few hundred bee stings. The man was treated at Loma Linda University Medical Center and released, the Redlands Daily Facts reports. Firefighters gave Daisy antihistamines and oxygen and washed her with foam before taking her to the hospital, where she died on Monday. According to the Redlands Daily Facts, the man had been keeping the bees illegally in his backyard.